Absolution La Creme De Sante Review (2018): Is It Safe To Use? Absolution La Creme De Sante Review : Ingredients, Side Effects, Detailed Review And More. What Is Absolution La Creme De Sante? ABSOLUTION LA CREME DE SANTE, US $38 for a 50 ml bottle, is a face lotion that brings back your skin’s optimal balance that supports healthy and beautiful skin. According to the manufacture Absolution is an all-natural skin care line established in 2009. Absolution is the brainchild of Isabelle Caron who wanted to make cosmetics manufacturing more responsible and sustainable. The company goes far and beyond cleaning up its on acts that comes with a certification from ECOCERT, and has been supporting its favorite charities by dedicating 2 per cent of its profits to help fund development work. Absolution La Creme De Sante : Does It Really Work? This product works by delivering prebiotics and botanical extracts that help restore your skin’s optimal balance of micro-flora which promotes improved skin health and, in turn, also the radiant and smooth appearance of your skin. What Are The Ingredients In Absolution La Creme De Sante? Coconut Oil: Has natural antimicrobial properties that help purify your skin, as it also promotes skin clarity, better moisturization, as well as healing. Honey: A powerful humectant, it supports skin restructuring, making your skin more capable of holding greater volumes of collagen which lifts and firms your skin. This product helps re-balance the skin. This product does not contain parabens, phthalates, phenoxyethanol, nano-sized ingredients, PEGs, silicones, and synthetic dyes and perfumes. This product is suitable for all skin types. Although many user reviews say it isn’t very effective. The formula has been touted by third party websites as not suitable for use of vegans. This product appears to have very limited availability, and may not be easily accessible if you wanted to buy one. Product color and consistency may vary and can potentially change over time due to this product’s all-natural formula. This product contains coconut oil which makes some people breakout. Does Absolution La Creme De Sante Have Any Side Effects? Based on this product’s composition, skin irritation and allergic reactions due to botanical ingredients is still possible, depending on your history of allergies. 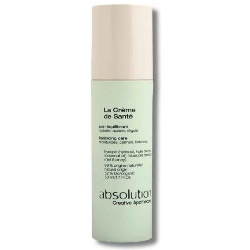 Use ABSOLUTION LA CREME DE SANTE after cleansing and toning. The manufacturer recommends layering this product with Serum Anti-Soif or La Solution Controle to dramatically rehydrate your skin and promote a blemish-free skin, respectively. ABSOLUTION LA CREME DE SANTE tackles but one area of care your skin may need but, there are other that your skin may need help in. If you prefer to use this, it is highly recommended that you layer it with another product that makes up for its shortcomings.